Jonah . . . An Example of Real Faith? Today, we’re looking at the passage where Jonah runs away from God. In this passage, Jonah is going to teach us about what real faith is. This may not sound quite right; after all, Jonah’s not usually considered a good candidate, at first glance! How can a prophet who runs from God be an example of real faith? Here, you can see that God intentionally sends a storm out to hound Jonah as he tries to get away. 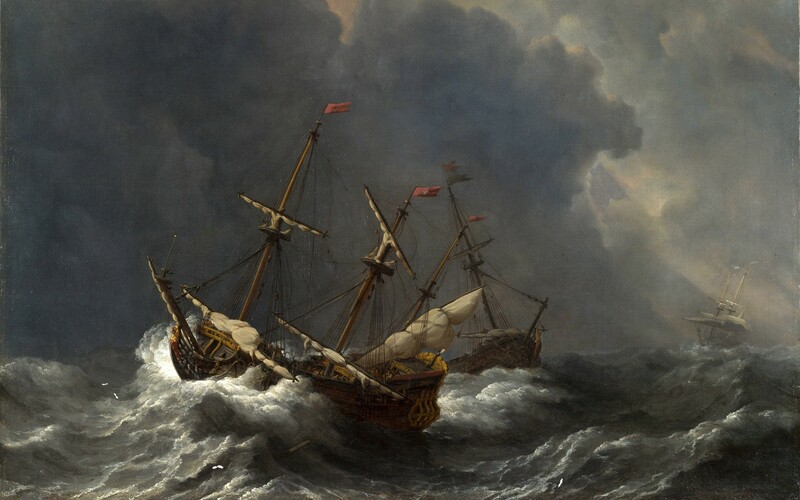 This is a very bad storm that threatens to break their ship in two! God does what He needs to in order to get our attention when we run from our calling. Somne people believe that God doesn’t have a plan and purpose for every believer’s life. I disagree. I believe God has made us each unique and special, and has given us different niches within our local churches. The Apostle Paul told us that we’re all different members of the same body – the Church. God gifted Jeremiah to be a prophet. He made Paul the way he was, with his peculiar background, upbringing, education and citizenship, in order to do a specific job (Galatians 1:13-16). He did the same for Jonah. Your calling, your specific gifts and your specific task are probably not as exciting as Jonah’s mission. But, you have one. Jonah had a calling from God, and he chose to run away. God was not pleased, and His word tells us that He will discipline His wayward children (John 15:1-2; Hebrews 12:5-11). The Bible tells us “the mariners were afraid.” I wonder how bad this storm was to make the sailors afraid!? They “cried every man unto his god.” Notice that man’s instinctive reaction is to pray to something higher than yourself. In this case, each sailor prays to his own god. You could say we’re “hard-wired” to do this. Where does this instinct come from? It comes from being made in God’s image! We’re hard-wired (all of us) to seek relationships with (1) other people and (2) with God. The sailors “cast forth the wares that were in the ship into the sea, to lighten it of them.” It’s amazing how quickly our priorities change when we’re in physical danger! If only people would realize that they’re in worse, eternal and spiritual danger without Christ! Now, here is a good question – why was Jonah sleeping? Shouldn’t he be awake, worried sick about God’s vengeance? Shouldn’t his conscience be giving him fits? the answer seems to be that Jonah had some bizarre, false sense of security. He knew intellectually that God could reach out and stop him in his tracks. But practically, however, he’d allowed himself to forget all about it Once we start down the path of stupidity and completely abandon God’s word on a certain point, we allow Satan to fool us into a false sense of security that isn’t real. The shipmaster seems to think, “the more gods we pray to, the better! Sooner or later one of them will hear us!” Isn’t it so sad to see a pagan urging the prophet of God to pray!. Consider how Muslims put our prayer life to shame! They’re unbelievers, and yet they pray several times per day! Jonah has come out on deck in the middle of this horrible storm. You can picture the sailors taking shelter wherever they could find it. Maybe in some cabin, maybe behind something solid. The wind and the waves are trying to break the entire boat into pieces all around them. The sailors decide to cast lots to find out who is responsible for bringing this evil storm upon them. God providentially arranges so that the lot falls on Jonah. Imagine how defeated Jonah must feel right now! Wakened out of a sound sleep to find himself in the middle of a terrible storm. Can you imagine the guilt and shame Jonah felt when they asked him what his job was!? This kind of claim is odd in a pluralistic society, but in the heat and fear of the moment the sailors aren’t going to have a philosophical discussion with Jonah. What they would have snickered at a few hours ago they’re now ready to take seriously! They don’t think it’s so funny anymore – now they’re completely horrified. Who is this God who controls the sea and the storms? Who is this guy that this God is angry at? Their own gods are discarded and forgotten for the moment – they can’t help them. They’re perfectly willing to accept Jonah’s God as the supreme and real God of heaven and earth – at least for now. All the loyalty, sacrifices and devotion they made have for their own “gods” is completely forgotten when their own lives are at risk of being lost. Meanwhile, the sailors are still standing there, asking Jonah, “what are we going to do! ?” It’s at this very time when God is doing what He must to get ahold of us, to grab our attention, that we ask ourselves that very same question. Remember, God chastens those He loves (Heb 12:4-17). He asks to be thrown into the sea, which would mean certain death. Why does Jonah choose this route? So the sailors won’t die. They’re suffering for something that he did, and he isn’t willing the they would continue to suffer – it’s not their fault. What Jonah does is an example of real repentance. He basically admitted, “it’s my fault this is happening!” He owns up to it. Why does Jonah have to be thrown into the sea? Why can’t he just repent and tell them to let him out at the closest port, and make his way back home? I think this is a very graphic lesson learned for us. Here it is – if we are serious about repentance, and we’ve confessed our specific sin and forsaken it – we ought to be willing to deal with the consequences. Jonah is the only prophet of God who ever actually ran away and defied God. He knew the storm was God’s doing. He knew God made the lot fall on him. The ship is about to break apart in this ferocious storm. This isn’t a walk in the park – they’re literally all about to lose their lives! Evidently God isn’t through disciplining him yet. What else can Jonah do? Somali militants who murdered 48 people in a Kenyan village as they watched the World Cup went door to door asking residents if they were Muslim or spoke Somali – and shot them dead if either answer was ‘no’, witnesses revealed today. The attack on the coastal village of Mpeketoni, about 30-miles southwest of the tourist centre of Lamu, came at the end of a weekend of bloodshed that has exposed the world to the shocking depravity of terrorists, apparently emboldened by each other’s acts. Witnesses told how about 30 gunmen – believed to be members of Somali terror group al-Shabaab – arrived in the town in minibuses at 8pm yesterday before bursting into residents homes, shooting dead any man they thought was not Muslim. He’d done wrong and he’d repented – he’d admitted fault. Now, he was willing to die if necessary it that was what God wanted. Jonah knew that was what the Lord wanted – and he was right. The storm ceased immediately. The sailors are terrified – God’s power has been demonstrated now more than ever. What does real faith look like? It doesn’t mean we’re perfect. Jonah wasn’t perfect. It means we own up to our sin when God chastens us. Jonah sure did. And when he had called the people unto him with his disciples also, he said unto them, Whosoever will come after me, let him deny himself, and take up his cross, and follow me. For whosoever will save his life shall lose it; but whosoever shall lose his life for my sake and the gospel’s, the same shall save it (Mark 8:34-35). Are these just profound words, or a command? It’s a command. Real faith means we’re willing to actually live our faith out in real life. Jonah was willing – and if God wanted Him dead for disobeying Him, so be it. That man in Kenya was, too – and was willing to die rather than deny the name of His Savior. Are you? “When Jonah was set on ship-board, and under sail for Tarshish, he thought himself safe enough; but here we find him pursued and overtaken, discovered and convicted as a deserter from God, as one that had run his colours,” (Matthew Henry, Commentary on the Whole Bible, 6 vols. [New York, NY: Fleming H. Revell, n.d.], 4:1281). “And shall we not put a like value upon the spiritual life, the life of the soul, reckoning that the gain of all the world cannot countervail the loss of the soul? See the vanity of worldly wealth, and the uncertainty of its continuance with us . . . Oh that men would be thus wise for their souls, and would be willing to part with that wealth, pleasure, and honour which they cannot keep without making shipwreck of faith and a good conscience and ruining their souls for ever! Those that thus quit their temporal interests for the securing of their spiritual welfare will be unspeakable gainers at last; for what they lose upon those terms they shall find again to life eternal,” (Henry, Commentary, 4:1281). C.F. Keil and Franz Delitzsch are spot on when they remark, “[i]t was not an evil conscience, or despair occasioned by the threatening danger, which induced him to lie down to sleep; nor was it his fearless composure in the midst of the dangers of the storm, but the careless self-security with which he had embarked on the ship to flee from God, without considering that the hand of God could reach him even on the sea, and punish him for his disobedience. This security is apparent in his subsequent conduct,” (Commentary on the Old Testament, 10 vols. [Peabody, MA: Hendrickson, 2011), 10:265-266). Henry, in his characteristically warm way, writes, “[i]t is the policy of Satan, when by his temptations he has drawn men from God and their duty, to rock them asleep in carnal security, that they may not be sensible of their misery and danger. It concerns us all to watch therefore,” (Commentary, 4:1281). “There is extreme irony here: a ‘heathen sea captain’ pleaded with a Hebrew prophet to pray to his God. It is sobering to see one who might be termed an ‘unbeliever’ pleading for spiritual action on the part of a ‘believer.’ The ‘unbeliever’ saw the gravity of the situation while the prophet slept. It is a sad commentary when those who are committed to the truth of God’s word have to be prodded by a lost world into spiritual activity,” (Billy K. Smith and Franklin S. Page, Amos, Obadiah, Jonah, vol. 19B, The New American Commentary [Nashville: Broadman & Holman Publishers, 1995], 231). Charles L. Feinberg comments, “[w]hat a shame that the prophet of God had to be called to pray by a heathen. How the Muslim with his five times of prayer daily puts us to shame as believers. Are there among us those who remember not to lift their hearts to God once a day?” (The Minor Prophets, Kindle ed. [Chicago, IL: Moody, 1990], Kindle Locations 2445-2446). Commenting on Jonah’s insistence that His God “hath made the sea and the dry land,” H.L. Ellison wrote, “[i]n a pluralistic society, it was difficult to find a title that would more perfectly express the supremacy of Yahweh,” (Jonah, vol. 7, The Expositor’s Bible Commentary, ed. Frank E. Gaebelein [Grand Rapids, MI: Zondervan, 1985], 372). “To run away from a god was foolish; but to run from ‘the God of heaven, who made the sea and the land’ was suicidal. Their question, ‘What have you done?’ was not a question about the nature of Jonah’s sin but an exclamation of horror. They were frightened to the depths of their beings,” (Smith and Page, Amos, Obadiah, Jonah, 235). Did Jonah tell them everything right now, as the storm raged? Or, had he told them the bare bones of his story before the storm struck? Nobody will ever know for sure, but I lean towards the latter option. “The fact that Jonah is fleeing from an audience with his god would generally not have been cause for alarm. But now the Sailors are overwhelmed by its significance,” (John Walton, Jonah, vol. 8, The Expositor’s Bible Commentary, ed. Tremper Longman III and David Garland [Grand Rapids, MI: Zondervan, 2008], 472). “When sin has raised a storm, and laid us under the tokens of God’s displeasure, we are concerned to enquire what we shall do that the sea may be calm; and what shall we do? We must pray and believe, when we are in a storm, and study to answer the end for which it was sent, and then the storm shall become a calm. But especially we must consider what is to be done to the sin that raised the storm; that must be discovered, and penitently confessed; that must be detested, disclaimed, and utterly forsaken. What have I to do any more with it? Crucify it, crucify it, for this evil it has done,” (Henry, Commentary, 4:1284). Did Jonah ask to be tossed overboard, content with the sure knowledge that God would save him? Some, like Matthew Poole, suggest that. I don’t. John Calvin writes, “[h]e seemed like a man in despair, when he would thus advance to death of his own accord. But Jonah no doubt knew that he was doomed to punishment by God. It is uncertain whether he then entertained a hope of deliverance, that is, whether he confidently relied at this time on the grace of God. But, however it may have been, we may yet conclude, that he gave himself up to death, because he knew and was fully persuaded that he was in a manner summoned by the evident voice of God. And thus there is no doubt but that he patiently submitted to the judgment which the Lord had allotted to him. Take me, then, and throw me into the sea,” (Commentaries on the Twelve Minor Prophets, vol. 3 [Bellingham, WA: Logos Bible Software, 2010], 55–56). Feinberg remarks, “Jonah confesses he is worthy of death and is willing to endure the punishment. These are noble words from a true servant of God. He was willing to sacrifice himself to save those about to die,” (Minor Prophets, Kindle Locations 2462-2463). Keil and Delitzsch agree, and write, “Jonah confesses that he has deserved to die for his rebellion against God, and that the wrath of God which has manifested itself in the storm can only be appeased by his death. He pronounces this sentence, not by virtue of any prophetic inspiration, but as a believing Israelite who is well acquainted with the severity of the justice of the holy God, both from the law and from the history of his nation,” (Commentary, 10:267). Tara Brady and Matthew Blake, “ ‘My husband told them we were Christians and they shot him in the head’: How al-Shabaab militia went from door to door killing non-Muslims as Kenyan village watched World Cup,” DailyMail Online. 16JUN14. Retrieved from http://goo.gl/Eryh5s. Jonah . . . the Missionary?